Escaping New York... to make sculptures in Nova Scotia! I’ve just wrapped up a wonderful and MUCH NEEDED month of traveling and art-maze-making (more on that...), which was both restful and creative! I’m excited to share my creations and some of the thinking behind it! I spent a few weeks returning to BernArt’s aMAZE. 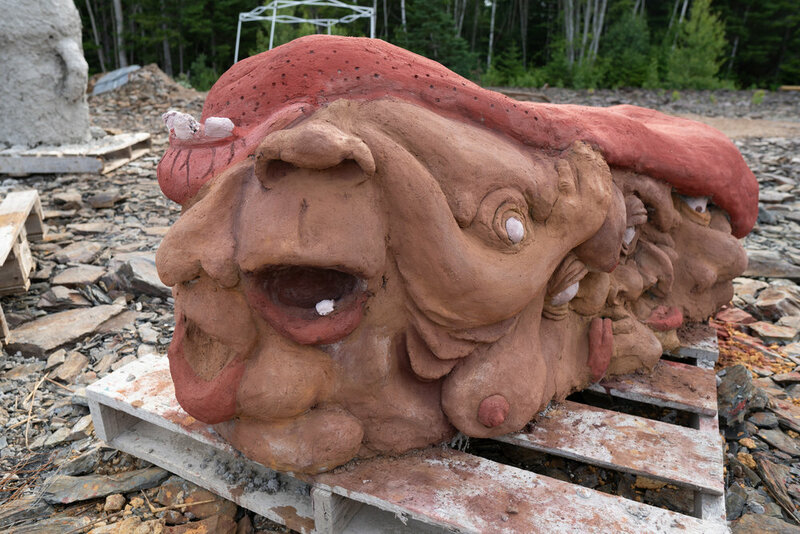 (After hitchhiking there from Montreal, but that’s a whole other post...) It’s a wondrous art maze that’s nooked in a very small-town outside of Halifax, Nova Scotia. It’s the kind of place that all the locals seem to know about, and are eagerly awaiting the opening on August 30. Now, now... What is the maze? Well, Bernd Krebes - an artist originally from Germany - is the brain behind the maze. He is a very whimsical and slightly outlandish man, with BIG ideas. He is the kind of person that will buy a fire truck just to, you know, have. Or literally blow up a hole in the ground with dynamite and make it into a swimming pond. Or build an art maze. (Yes, he’s done all three). 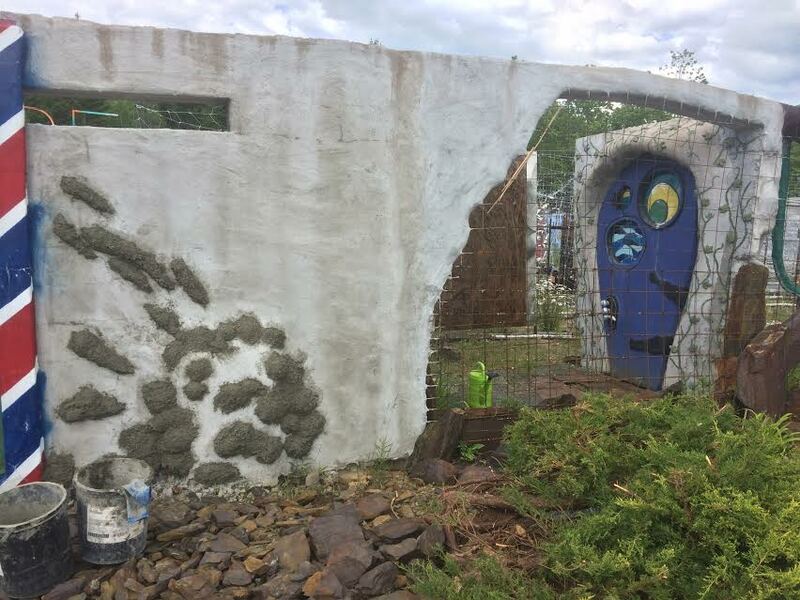 The art maze is a concrete maze -- one he conceptualized nearly twenty years ago, and began building five years ago. It is filled with paintings and mosaics and sculptures he has created, along with travellers and artists from all over the world who are passing through this small town to work on this maze. I’ve walked in an out of this maze dozens and dozens of times, and I’m always amazed by the new details and crevices that I discover. Definitely a feast for the eyes! I was at the Maze last year, and had an incredible experience. I learned SO many skills (Concrete! Welding! Mosaics! ), which was so rich and humbling. As a maker, there’s something really exciting about being given a new medium to play with - and something you know nothing about. Where you have to let go of your ego, your expectations, and ask for help and “what’s next?” Last year, I created Tinker Tunk. I was sad to leave her unpainted, but concrete generally takes a few weeks to completely dry before being ready to be painted. So, alas, I thought to myself, “I’ll come back next year and finish her.” And so I did. Swipe to see some of the process below. 2. GLOOBIE BOOBIE CHAIRS ONE N’ TWO (working title, ha). Last year, Bernd mentioned that he wanted more seating for the maze - so that was my starting point. “Let’s make a chair!” I’m no furniture maker, but the blurs between furniture and sculpture is similar anyways. Derived from a very, very scratchy sketch (below), I let these creatures grow pretty organically; curves bending into each other, drooping, rolling, and all the other delightful ways human bodies exist. After spending May working on family-friendly-super-wholesome commissions, I think I had an itch to play with something a bit more grotesque. It was fun to make! I used a pigment to stain the piece, which I’m not 100% happy with, but I’m also learning to let go of perfectionism. A little bit. 3. WITH THE SUN IN HER CHEST, SHE WENT TO FIND THE MOON. I painted a little mural, which was also a joyful process for me. It was nice to be working on a mural, alongside the cement sculpture, because there’s an immediacy to it -- paint to wall -- that seemed like a good “break” from the procedural steps of cement sculpting, where you have to wait for things to dry, do things in a very specific order, etc. I was given a bit of a strange wall -- one with a curious shape and some unwanted blobs sticking out. I used this to start my chicken-scratchy designs (see below). 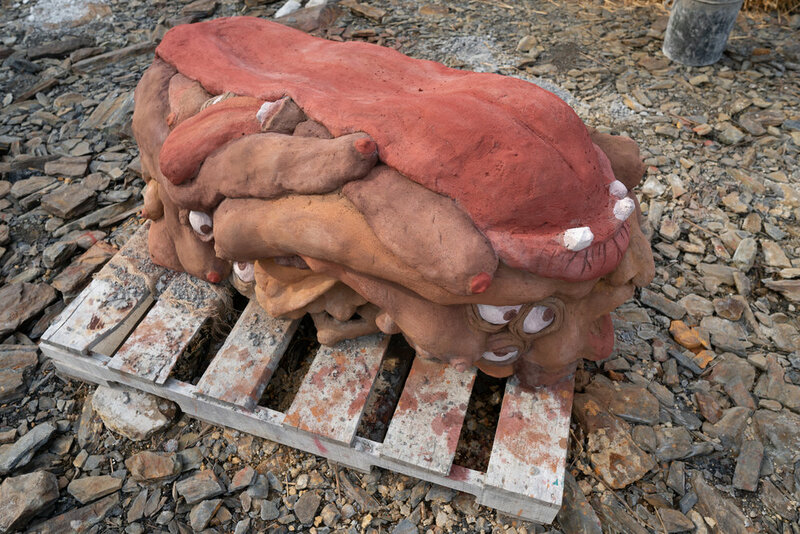 Similar to my sculpture, I kept my process pretty organic, allowing it to evolve as I moved on. My narrative originally evolved around creating a woman biking into the unknown, leaving a trail of colours and whimsy behind her (perhaps a kindred “free spirit” that I am trying to channel?). But, I kind of steered away from this character. I’ve been thinking a lot about movement and migration, and I didn't want to romanticize this “path less traveled” character, because... I don’t know, exactly... There’s something incredibly privileged about being able to just... wander. And I just didn’t feel right romanticizing that. I DONT KNOW. But something didn’t sit right with that during all the immigration-fuckery in America. ANYWAYS, a bit of a back story. I’m still not sure if this mural is really “about” something. 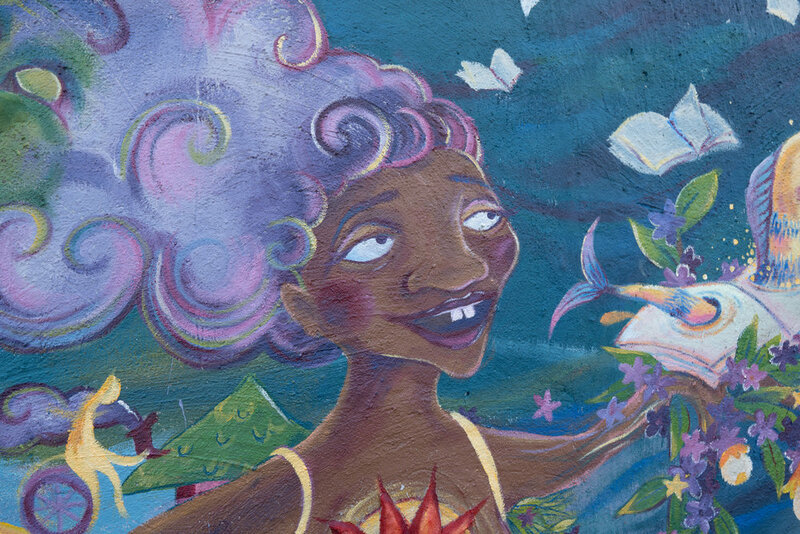 I often feel a pressure to create work that “says something.” Which I think is important - for sure - and murals and art have power to speak truths and spread incredibly meaningful messages. I feel like I’m constantly trying to self-justify play, which I was battling a bit with this mural. But here it is: a result of play! Sort of a big doodle, but on a larger and more colourful scale. I added some 3D elements, which is a whole new creative adventure I would love to explore x100. Maybe next year... There's still a bike wheel and a moon-creature sculpture that needs to be added (Bernd will do it later this summer), so it's not 100% finished. But a peek below. And that's all! I'm so grateful for the total creative freedom I've had over the past few weeks; it's certainly a magical space where ideas can become a reality! I'm happy with how these pieces turned out, and also learned a lot - both about cement/ sculptural/ making processes, and also about resting and taking time to myself. I’ve been out of New York City for about a month. Which feels like both half-a-year... And also like a week! How confusing! I’m so grateful for the time away, and for my freelance schedule that allows me to escape for some time. Besides the constant creating, my life at the Maze is almost 100% different from life in NYC (like, zero commute, zero social pressures, lots of sleep and down time, etc). While I missed the energy and diversity of NYC, it was a much-needed recharge. I am coming back to NYC feeling more committed to self-care and balance. As I experienced at the Maze... Those are nice things to have and make me feel much more present with both myself and with others.